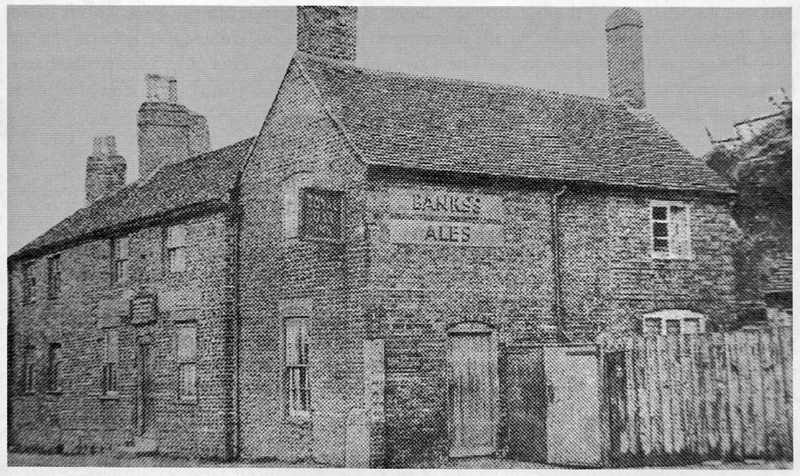 Sadly originally from a newspaper scan, this image reproduced from 'The Old Pubs of Lichfield' by John Shaw. 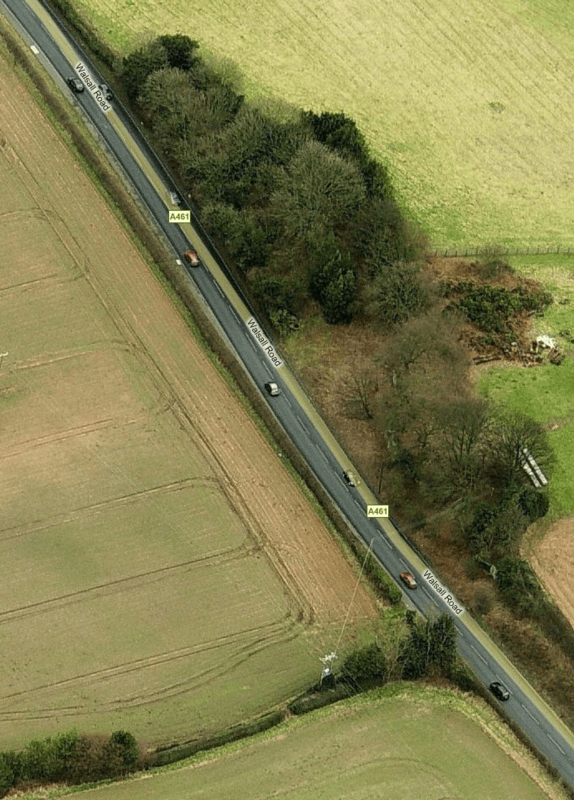 Some weeks ago, regular reader and commentator [Jeepboy] posted a comment on the ‘Pubs we’ve lost’ post enquiring if anyone recalled the pub that used to stand in the cutaway to the sandstone rock face on Pipe Hill, between Lichfield and Muckley corner. The cutaway itself is usually hidden in summertime by trees and himalayan balsam, but is quite evident in winter. The site of the Royal Oak today, captured by Multimap.com. This still existing house on the opposite side of the road to the Three Tuns, is recorded in 1811 to George Holdcroft and is called the Royal Oak. Again, it’s purpose was to serve the waggoners and to provide trace horses for the climb. By 1818 it is listed to a J. Sadler who held the pub to 1860, when it was taken over by Henry Litherland. The pub appears to have closed around 1868, moved up the road and relocated to the premises that are remembered by many as the Royal Oak. The Sandyway buildings then became a farmhouse again and remained as such until a few years ago when it suffered a fire. At the time of writing (as it does now) it still remains semi-derelict. Moved up the road in 1868 and first listed to Charles Small, this is one pub many people remember but cannot remember it’s name. The picture illustrates it in the 1960’s; the only remaining sign is the little lay-by on the left of the road just before the top of Pipehill. The Royal Oak was one of the last beer-only houses in the city , the last recorded landlord was Harry Wright. The pub closed in the mid-1960’s and the buildings were demolished in 1968. To look at the site it is difficult to believe that a pub stood here. Most of the rubble remained on the site, which is now overgrown giving little sign of it’s existence. I like the concept of a 'Neat mansion' - White's 1854 History, Gazetteer and Directory of Staffordshire. A wonderful old map: Creighton and Walker's topography was gorgeous. I’d like to thank [Howmuch?] for his dedicated, dogged and exhaustive research for this post. It’s jolly decent chaps like him that make writing this blog such fun. Cheers, mate. This entry was posted in Environment, Followups, Fun stuff to see and do, Interesting photos, Local History, Local media, Reader enquiries, Shared media, Spotted whilst browsing the web, Uncategorized and tagged Creigton Walker map, Derelict, John Shaw, Lichfield, Lichfield local history, Local History, Lost inns, Lost pubs, New Photos, Old maps, Pipehill, Pubs, Sandyway, Sanydyway farmThree Tuns, Staffordshire, The Old Pubs of Lichfield, The Royal Oak Pipehill, Walsall Road, White's 1854 Pipehill. Bookmark the permalink. ditto the thanks to Howmuch? and also to BB for including it in his blog … should settle an arguement and earn me a free pint down the pub!!!! Thanks for this, and I vaguely remember the pub from when I was a mere youngster travelling to Lichfield with my parents. Good work Howmuch? and Bob. can anyone explain what a beer-only house is? A pub that sells beer and nothing else presumably? Both myself and Howmuch? pondered this at some length in the pub last night. We don’t actually know, but assume it served only drink as you speculate. We’re open to suggestions… I mean, certainly in the 80’s here in Brownhills and the wider Black Country, it wasn’t unusual to come across non-food pubs, and I can think of 2 or 3 still about in the late-90’s. It would seem really odd were the last non-food pub in Lichfield to close in the mid-60’s. I think it only had a basic “beerhouse” licence -enabling it only to sell beer & ale rather than wine & spirits. I will ask my mate Reg [who instigated the whole question of the missing Pipehill pub] who claims to remember drinking in there – even though he could not remember its name! I’ve never spoken to anybody who had even heard of this pub, never mind had a drink in it. Many moons ago, myself and one or two friends used to take a glass or two in the Lichfield area and I well remember this particular pub as one of the friendliest I have ever been in – before or since! Good memories! While we’re on the subject of pubs, further along the Lichfield to Walsall road, on the same side as the Royal Oak, was another pub, between Shire oak and the Boat. I couldn’t remember the name of that one either but I mentioned it to the oakparkrunner and he had it right away – the Red, White and Blue. (He knows too much about pubs!!!). I believe that the building is still there. Jones’ or Smith’s crisps JeepBoy?! I’ve knocked a fair few Vimtos back myself – usually in the back of my dad’s van! The Park Gate was a favourite. Nibbitts were a puffed potato snack – no longer available but you can get Pombears at Morrisons or Hooty’s which taste similar – I still enjoy they odd Vimto! Whilst on the subject of RW&B – after it was delicenced it was called Red White and Blue cottage. I always thought it a pity that the renovators chose to drop the name. A little bit of heritage lost !! I am a descendent of the Royal Oak landlord Henry Litherland – my 3Xg grandfather. I found this information very interesting and love the map. Thanks! The pub was known as “The Rock”, I used to go there as a young boy with my father after a days fishing in Fradley. My father, George Edwards, along with his friends, Freddie Thomas and Percy Pratt used this pub as their regular. (Percy was the other brother of Pratt & Newey, Coppice road, Walsall Wood though Percy was not a share holder). I used to sit just inside the entrance which was on the side and watch the guys play cards. There was one felow who had no arms, yet played cards, drank his beer and drove his car with his feet. The son of the last owner of The Rock still lives locally, we made contact a few years back. It was a very warming place to be, comforting, like visiting some relative. On summer days, my father and I would catch the bus from Shelfield and go to the farmers market in Lichfield. For luch we would go across the road to a house that had been made into a cafe and get a cup of tea and a bacon sandwich. We would then walk home across the fields all the way to Castle fort then take the roads home. In the Spring around Wall when the fields had been ploughed there would be some Roman coins that came to the surface along with pottery shards. I had a wonderful adventurous childhood with lots of fond memories even though we did not have much. The last pub I used myself regularly was The Horse and Jockey in Walsall Wood run by Horace and Annie Stringer (we ran the Lichfield and district Motorcycle club from there). Lots to say but no time at the moment. Now living in Vancouver Canada. I hope you enjoyed the information. Thanks, Brian, that’s wonderful. Really love this stuff – this is a classic example of something that started as a discussion in a pub one night turning into a real bit of living local history. the chap with no arms was probably Alf Mears who was also a mechanic in his younger days and finished his working life on the switchboard at St Michaels hospital, I new him at the Lichfield model car club late 60’s when it was in Borrowcop Lane. He died a few years ago up Yorkshire while living up ther with relatives the Mercury did a half page write up of him at the time. 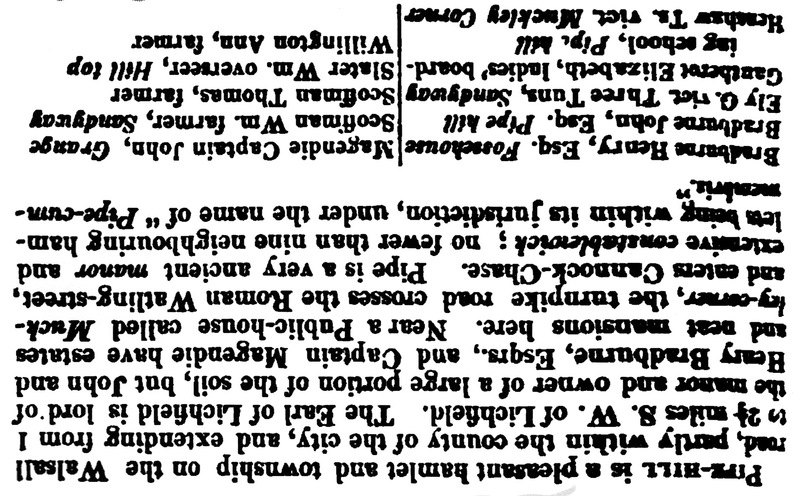 After reading some of the old Newspapers in connection with the licence sessions, I get the impression that a Beer House was distinct from the pub as being only able to sell beer only. The Licence was granted on application to sell beer within the premises, and it may also be possible to brew there. A further application was needed if you wanted to sell via an outdoor. I Remember The Royal Oak Pipe Hill in the 60s The last landlord was Harry Wright who had worked for me as a Barman at the Bulls Head Fradley and the Turks Head Sandford St. Anyone who knew Harry would know he was quite deaf and wore a rather large hearing aid.He was a rather good Darts player from what I remember. When he was licensee of The Royal Oak which had only a Beer license he would keep bottles of spirits under the bar for anybody who needed a tot. I remember the Bulls Head at Fradley. I used to live on Fradley Estate. My mum Joy was a cleaner at the pub and we used to go there with her when we were very young. I’m sure the Bulls head burned down twice and because of that it was decided not to build another. I’m sure a petrol station sits on the plot. I’m sure it burned down the second time in the early 80s. I have recently set up Fradley History Society and I am also researching the Bulls Head Inn. Could you please share any information you have on the pub with me, along with any other Fradley History you may have? Hi Derrick, you mentioned Harry Wright worked for you at the Bulls Head in Fradley. Were you the landlord? Or do you know who the last landlord was? Robert, I’ve just started looking into my family history and my Great-grandad was called George Hodges and he had the Royal Oak at about that time too. Although I think that his Royal Oak may have been a different one (in Sparkhill and no longer going by that name). I have a picture of George, his wife and (I believe) my Grandad outside the pub it that would be of interest to you? That was before it was called the Royal Oak, it was called Holt then. You can contact me at duffythebegonslayer@yahoo.com if you’d like to see it. If we are talking about the same man then I would be very interested to find out if there is anything else that you could let me know. Hi i’m trying to find some information on an old pub called the red white and blue on the walsall road it is now a house called the willows. All I can offer is that the last time I went in there was in the mid 1960s with my brother Robert (Sailor) Edwards and his friend Gordon (Gogga) Gibson (whose father Elijah Gibson ran the Top Oak for many years. I was fourteen at the time and the only beer they had was a barrel sitting on the bar which was usually for the farmers sustenance but knowing our Bob and Gogga the landlady would allow me a half pint and the others a pint. This was a regular occurance as in the summer months we would walk to Lichfield and back for a day out and whilst doing so we would pop into a few pubs on the way. I came across this article by chance and I have one or two things I could add. Though I never went in The Royal Oak (I was too young) I remember it clearly. It always surprised me that the pub was there but I believe all the pubs along the Walsall Road existed mainly to cater for the drinking needs of workers taking market garden produce from Lichfield to Walsall. They would often stop off on the way back. Hence the numerous pubs …almost all of which have gone. Next time you are in the area (early months of the year are by far the best) look at the hillside adjacent to the new roundabout, just up from the site of the old pub. You will see the site of an old cottage (single? pair of cottages?). Again I remember them in the early sixties; by then they were derelict and ‘tumbledown’. ***Look hard at the vertical ground at the back of the site. You will see places where spaces have been hewn out of the soft ground to create storage spaces. I am pretty-sure the hillside was the back wall of the cottages. ‘hope this is of interest! I remember going into the Royal Oak when I was very young, (in the mid sixty’s) and was fascinated that water that came out of the rock at the back of the pub ran along a trough at the base of the bar and out of the door. Interesting post. I am also related to Henry Litherland, he was my 3x great grandfather. Went with my parent to this little pub.Hard to think now that it was big enough for a pub.Happy memories. The Turks Heads was where the Lichfield and District Motorcycle Club began. This was in the early 70’s and in those days it was possible to get world champions come on by such a humble abode so as to share their stories. Mick Grant being one who road for the works Kawasaki Team, South African Korkie Ballington being another who owned the title of World Champion four times and numerous others such as Peter Williams and Dave Croxford, the famed riders for Norton. Because the club was acquiring more members I moved it to Walsall Wood. I cannot remember if it was Derrick who was the Licencee back then. I had at that time an old 650 BSA with a plunger frame. Hi Clive. I remember you so well, especially your bike. There was also a fellow named Graham with a Triumph Bonneville who frequented the club and of course Kenny Honda. The one year we had a most wonderful stand at the Bower. You may also remember my wife Glenys who was voted Miss TT in 1976. When I came to the club I was riding a BSA 650 Thunderbolt before buying my first Japanese; a 750cc Suzuki GT. There was lots of fun at the club and on weekends we took off to the races. There was the fellow who was the coroner from Walsall. He used to bring along the film equipment that was normally used in the morgue for examination and observation and show movies for us. Great days and wonderful people. Get back if you wish. Cheers and good health to you. 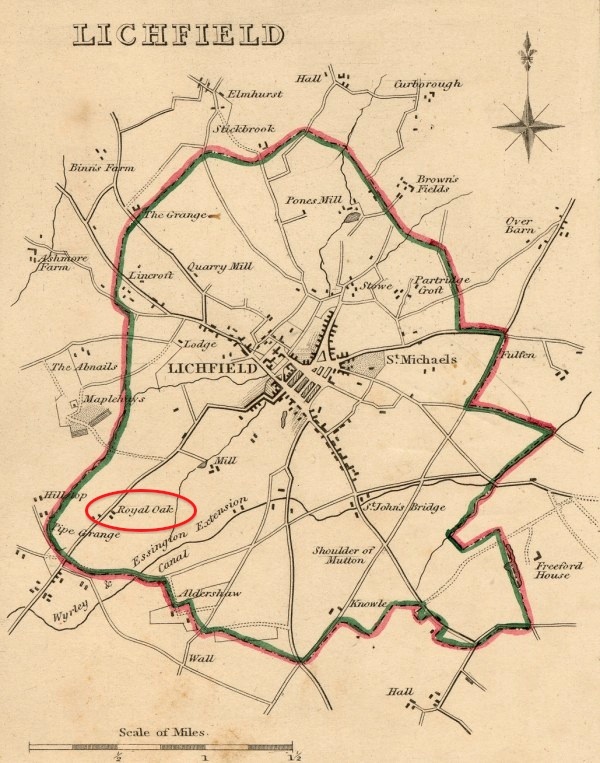 Do you still live in Lichfield? Thank you Bob for allowing this connection. Just to make a point; the movies he showed were not from the morgue. I know it reads that way. Hello Brian. You made me smile when you mentioned the legendary Kenny Honda, a few years ago I went to the Swan at Fradley, and there was this bloke riding a Honda Cb400 4, he was riding the bike like a nutter, when he took his helmet off it was Kenny Honda (I should of guessed it would be him) RIP Kenny. yes brian I remember you and the misses, there are lots of folk I only remember there faces now, well it was 30 years ago! by the way I live in Brownhills / Walsall Wood. I’ve still got my lapel badge of the Lichfield District M/C Club, I will hang on to it in case there’s a rebirth of the club! I’ve still own a motor bike it’s a xv535s Yamaha v twin.